, compared to 2016, and reach a total of $107,745 a year. One of the biggest contributing factors of salary growth is experience, and the way that engineers can leverage their experience to get the best possible pay will make the up-most difference. After analyzing thousands of job placements across the US and Canada, we built a graph that demonstrates the growth of annual salaries by experience level in the tech industry. Looking for a job in the tech industry? Click here to check out our Online Job Board! College Grads and Those Who Have Few Years of Experience in the Tech Industry. You’re probably wondering why the above graph illustrates that having “0 years” or no years of experience in the tech industry can get you a higher paying salary than someone who has one or two years. Surprisingly, entry-level university or college graduates with little to no experience can actually negotiate a 4% higher salary than their peers who already have some experience in the industry. The reasons behind this are: (1) with a shortage of tech talent, there is fierce competition amongst big companies to attract engineers and tech graduates right out of school. (2) If the candidate has little experience, but is already searching for a new job, it’s a big indicator that something went wrong, such as termination of employment. It could also indicate that a person is looking for some type of career change (industry, company, technology, location, etc.) and would be willing to settle for a lower salary. (3) Once graduated, many young people try to find success as entrepreneurs. If that fails, a lot of them will then resort back to the job market, where their experience as entrepreneurs partially counts but their earnings at the time were little to none. Therefore, there is more leverage for an employer to offer less. Want to get your foot in the door working for a big company? Join us at a Tech in Motion event to meet and network with other tech professionals and enthusiasts in your city! View our calendar here. Tech Salary Growth Virtually Stops After 15 Years of Experience. As illustrated, someone with five to ten years of experience will see the biggest increase in salary. This is because there is a vast and apparent difference between, for example, a Java Developer with five years of experience and one with nine years of experience. Also, for many tech professionals, this period could be characterized by a big career move or change, such as relocating to a more pricey area, acquiring a senior or executive level role, learning a new technology, receiving an advanced degree, or switching from a small company to a big one or vice versa. 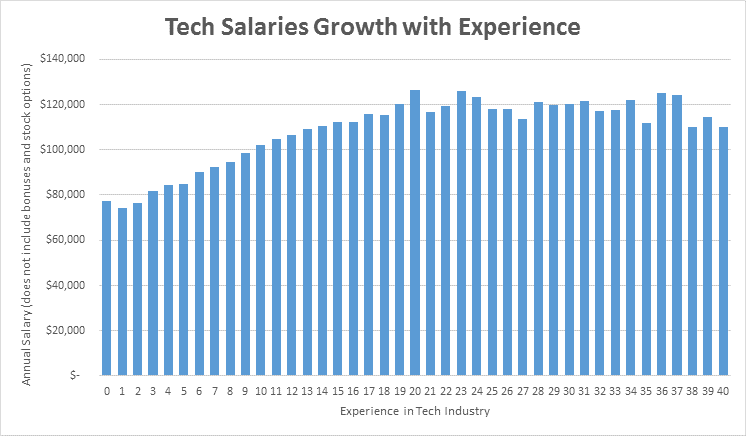 However, based on the data we’ve found, the growth in salary virtually disappears for tech professionals after 15 years of experience, and there are many reasons why it happens. One reason is that many experienced technologists are moving into higher level roles on the corporate ladder, turning into stakeholders or executives, or becoming independent business owners. Therefore, they are not considered “tech professionals” anymore and are no longer in the same salary bracket. Another reason why salary growth diminishes for tech professionals after 15 years of experience or more is because it may be hard to keep up with new trends in technology and compete with new tech talent entering the workforce. Also, it’s hard to convince your employer that your degree from 1990 and your 27 years of experience is better and deserves a higher pay than a person who graduated in 1996. In order to continue growing your salary in the long run, you need to continuously develop your skills and experience. Contact a local Jobspring Partners or Workbridge Associates to help you in your job search! Want to read the entire article? Check it out here. Consider relocating if you feel that higher paying jobs are limited in your country, region, or city. For example, based on our data, over 60% of tech professionals who make $200K or more live in the San Francisco / San Jose area; another 10% of professionals with salaries over $200K live in New York City. Learn new technologies to be highly demanded or a “hot commodity”. Those who learn cloud computing, data engineering, iOS, Android, C++, DevOps, Java, Perl or UI/UX can expect anywhere from a 7% to 26% increase in salary. Demonstrate that you are not only a developer who knows how to code, but also a leader who can make decisions, train, mentor, supervise, manage, and lead a team. It’s all about how big your impact is on an organization, which is why it is recommended to take additional classes in management and leadership, or even pursue a Master’s degree in engineering, computer science, management, finance, or business administration (MBA). A Master’s degree will help your negotiating power when pursuing a top level position. Consider moving to a bigger or smaller company. For the most part, large companies have more resources and can provide higher salaries and growth opportunities. On the contrary, if you already work for a big organization, try to look around for a small startup, as your experience could be valued as a “treasure” and this company may be willing to pay you more for what you can offer.